Hand Made Oak with Leather insert panel. ​Walk in wardrobe with dresser behind head board. Large open plan kitchen, dining & living space. Contemporary handle-less Warendorf kitchen furniture. Siemens Appliances including Steam oven, Falmec Nuvola white glass extractor built into besoke ceiling canopy. Hidden mood LED lighting. Large undermount stainles sink with recessed drainer, Drinks area with matching Quooker taps though out. 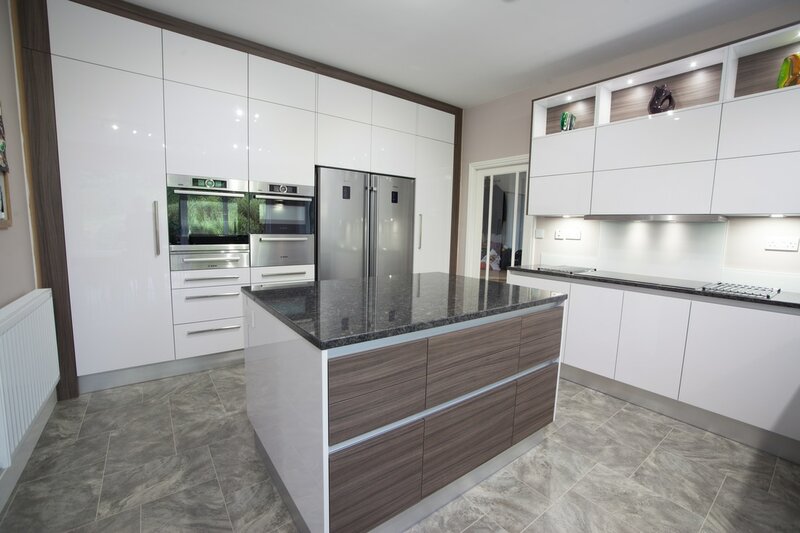 Stunning Armac Martin Handles to tall larder and appliance housings. Large open plan Kitchen Living and dining space with a contemporary modern square frame shaker kitchen door and panel kitchen. Silestone 'Blanco Orion' quartz stone worktops with prep sink and quooker twin taps in large island. Bank of Siemens appliances with White glass Westin extractor built into bespoke ceiling canopy. This new build 5 bedroom property (completed in 2017) was designed and created as a team effort. Interior design services provided by Tricia Carroll Designs. With the property designed by Aleksa Glancy Design. The result is a wonderful family home with a mix of modern and classic touches that will stand the test of time. 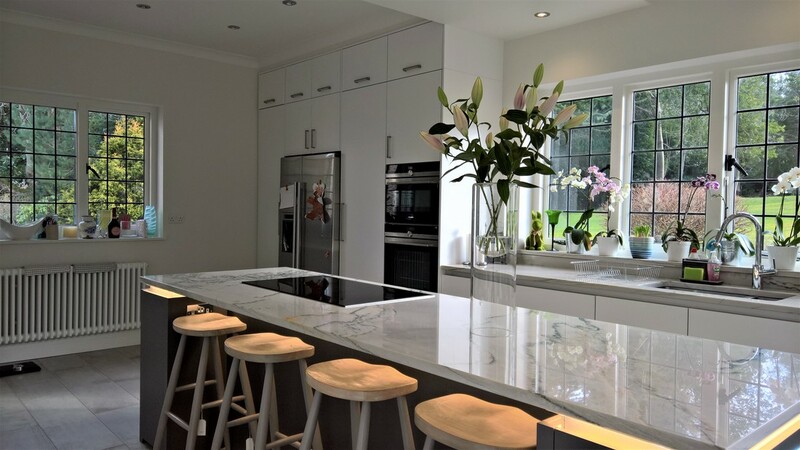 Working with London Developers Capital Estates, Farnham Furnishers have created a modern Warendorf kitchen with textured Shell Oak doors contrasting with beautiful marble worktops. Marble wall cladding adding luxury and harmony to the open plan living space. ​Including their new all in 1 induction hob & extractor. ZIP - Hot Cold & Boiling tap. Hand made Handleless kitchen - recessed walnut finger rail. Walnut veneer base units with hand painted tall units built into a recess with walnut shadow gap trim. Secret doors through to Utility & Pantry with white tambor to drinks area with Quooker tap. ​White glass Miele appliances including full size steam oven. Shaker style with 80mm staves and chamfered frame. Pippy oak carcase with dove tale jointed oak drawer boxes. Siemens appliances, quooker boiling water tap and Sile stone quartzstone worktops. Large 2100 x 1900 island with unique bulkhead over island housing Falmec extractor, designed to show off the butterfly ceiling detail. Removal of worktops, appliances and wall tiles. Laying of new porceline floor tiles. Installation of new Silestone quartz worktops, under mounted sink, Quooker fusion tap with water filter, Siemens ovens, hob and extractor. ​Sand down and paint all existing furniture, finally installing white glass splash back and contemporary steel handles complete the look. Furore Handle less Gloss Grey Dark & Dark Olive. Combination of Siemens and Miele appliances. Silestone quartz worktop, 50mm stepping up to 80mm for breakfast area.